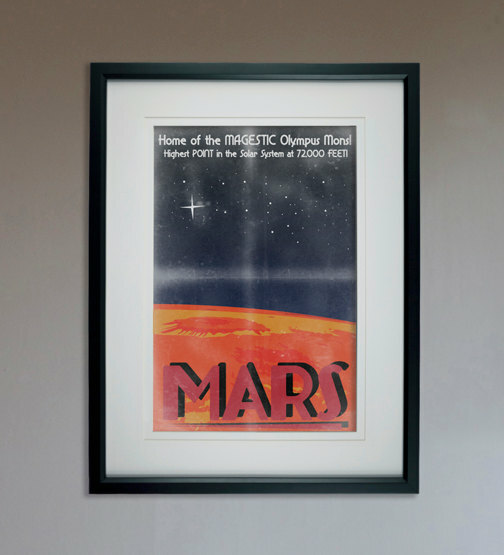 Our most popular retro sci-fi poster, Mars! The Red God, Mars, Earth’s sister world, has always appealed to humanity. So travel to this supposedly barren rocky, red world for an adventure. Go sight seeing at the Olympus Mons Intergalactic Park and stop off to see the remains of an ancient martian civilization! Taken from the pages of vintage sci-fi, this poster shows what vacation once might have looked like given the right technology.